"I am writing this letter to truly thank you so very much for all you have done for our company. We have worked with you for the last 3+ years. When I look back at making a decision on what company we would partner with for our copier needs it was very important to choose the right company. You just don't know what to expect from companies that make promises, but never follow through. From the moment we met you have always stood behind what you said you would do. Three years later you have gone over and beyond in the service you have given us. You kept us in business and functioning when we were the old company and with the buyout you have gone the distance to keep us up and running in the difficult transition. As the Administrative Director of our company, I am always dealing with vender issues and with your company you have worked with us and have always told us exactly what to expect and you follow through. We cannot put into words how much we appreciate your partnership and look forward to continuing to work together in the future." About the helpdesk: "Needless to say my problem was solved and it was a pleasant experience. In a very calm manor he walked me through what I needed to do and what he could do to fix the problem. It is nice to know that there are people still left in this world that take their jobs just a step beyond and not just treat it like a paycheck." Concerning a printer move: "He was efficient with his timing and knew exactly what he was doing. This is the smoothest move we have ever had when moving copiers and printers." "I am extremely impressed with the same day service I received. I am equally impressed with the customer service I received..."
"I wanted to take a moment to let you know how impressed I am with Advanced Office. We have so many choices when it comes to purchasing copier, and service contracts. I have companies approach me all the time with offers of service...I will not even consider another option. Your team has never let me down, and I know I can count on them for anything I need." "The main essence of this letter is to convey our deep sense of gratitude and appreciation at your impressive show of support and solidarity of our Printing Services Department. In addition, we want to share with you how pleased we are with the quality of service your Service Technician has provided. We sincerely appreciate your responsiveness and the way your Service Team conduct business." "I wanted to take the time to let you know what an amazing job Tony has done taking care of our firm's copier/printer needs over the years. Our latest adventure required coordinating electrical work, removing mailboxes from one machine and installing on another, relocating it, bringing in a new copier and taking one to our Van Nuys office for set up today. WHEW! Tony assured me he would handle every detail - as usual - and he did - as usual." "In this day and age it is so reassuring to know there are vendors such as Advanced who are always looking out for their customers and doing right by them." "He is a first rate tech and he has excellent customer service skills. He gets out to us quickly, he communicates with us both by calling as soon as he gets the service ticket to give us an ETA and when he is done with a service call he always let's someone know the status of the machine." "Yesterday we called late in the day with an emergency. Out HR staff intended to be working late into the evening and through the weekend with a lot of documents needing to be printed. Their machine started printing really light, poor quality copies. Doug called us around 4 or so and he was wayyyy up north but let us know that he could be down buy 5-530p. he made it a little before 5:30p. Doug provides prompt quality repair work...and he does it with a smile." "The man that came here to help set everything up, I believe his name was Tony, was awesome!!!" "...I want to express our appreciation for your help with our office equipment needs and for MANY years of excellent customer service." "They were painstakingly thorough in analyzing our copy machine needs and the solutions to address our copy needs. I was truly impressed with the executive summary they presented...Lastly,I want to state how satisfied my staff and I are with the Ricoh Copiers that we have received. Harold has been instrumental in training the staff on the use of the copiers." "I can not express how grateful I am to you and your staff for rescuing me in whatever dilemma my office equipment ends up in...Your management skills in assembling and maintaining skilled technicians saves countless expense in replacing really important operating equipment." "...Not only were we given better pricing on both the equipment and the maintenance agreements, but your customer service has been exceptional. Your service technicians are always prompt and skilled and our supplies arrive the next day in most cases...Again it is a pleasure and we know the right decision was made in partnering with Advanced Office"
"We think it is important to take a few moments to commend Mr. Pham for his always timely, helpful and knowledgeable service. Just as important, Mr. Pham always has a smile...and is always willing to solve any problem or respond to any request we make." "When I first entered for service today I was greeted cordially and professionally by Mrs. Julie Deck. She provides the kind of greeting that lets you know you are in the 'right place'...This kind of service and attitude serves to reflect a high degree of quality at Advanced Office and I truly appreciate it and wanted you to know about it." "... wanted to let you know, however, that I am very happy that I came to Advanced Office for this purchase. I appreciated theknowledge and professionalism of your staff. I compared machines and companies before making my decision, and Andrew provided all of the information that I needed to make an informed decision about the merits of your machine and the services you provide..."
"The sales 'experience' from first contact, through decision to installation and instruction, was positive one, and I will recommend your company to others as a result. Thank you." "We wish to extend a special thank you to both you and your staff. You were there when we needed you. It is a refreshing discovery and very much appreciated. Not all businesses take your approach to do the right thing." "Jerry did a very efficient job at determining what was wrong with our fax machine - In addition, he was polite, very professional, thorough, helpful and he provided us with various solutions to our equipment problems." "I would like to take the time to let you know how much I appreciate the effort that you and your team made in the transition from our Canon copiers to our new Ricoh copiers." "Not only did you take such great care to make sure that we had purchased the equipment that best suited our needs but you also followed through in all areas to make sure all equipment was delivered, connected and working properly." "I would just like to say that I feel that you and your team make us feel valued as a customer and that means a lot to myself and our organization." "I would like to thank you and Advanced Office for the excellent customer service you have provided..."
"Your professionalism and prompt reply made our selection for our new copy machines an easy process." "Your attentiveness in training our staff has been exceptional and very much appreciated." "Your driver / copier installer did a great job. You might want to tell his supervisor he is very professional, helpful, product knowledgeable, and a very positive attitude about our company. Everyone has been easy to work with." "We appreciate everything - Great Customer Service!!!" "I also wanted to thank you for all your hard work during the Copy Center remodel. You were a pleasure with which to work - always so positive and willing to get the job done. You made a difficult situation look easy!!" "John was extremely helpful and patient today. I appreciate all the help in getting my issue resolved." "I wanted to give some positive feedback regarding the onsite training that we received from Kimberly Smith. She was friendly, personable and very knowledgeable. She clearly explained everything that we needed to know about the copier, and left her business card in case we have any questions later." "I just wanted to tell what a great job Ruben has done with the broken printer in the BTEX Department. He set aside the time to get the right parts, was very detailed in cleaning and explaining what needed to be replaced. Everything is working smoothly, please let the powers that be know Ruben is a valuable asset to your company!" "I have to tell you, I love it when Tony comes here. He is such a geek. He makes sure that everything is in working order the correct way. You are very fortunate to have such a great employee. Thank you so much for getting him here so fast." "Just wanted to say what a pleasure it was to have Gil service our printer. He usually comes to service for us and is always a pleasure to have come in. He truly deserves a pat on the back." "All is going well with the copiers. Kim did a great job at showing us a lot of the new features on the copiers we never used before." "It was a pleasure to do business with your company...Our experience from start to finish was AAA rated. We have other printers in our office of a different brand; as they need servicing we will be contracting you." "Great customer service is hard to find these days and Jeff is an asset to your organization. I look forward to working with Jeff again and have the confidence that he can/will get it done." "...Doug on the other hand, has always been a pleasure to work with. He understands the urgency of resolving our issues, and he is always willing to go the extra mile to do whatever it takes to ensure that we are not down for any significant period of time. He is very professional, and he is completely thorough when analyzing whatever issues may arise. He has an exceptional knowledge base for our equipment, and he produces positive results 100% of the time." "I wanted to send a quick note to thank you and your team for your support in implementing your services for our copier fleet...It was refreshing to see how the team took ownership in making sure the transition would be as seamless as possible for our departments." "Just prior to the Christmas break, Kaye Monachelli had the rather large task of delivering 73 duplicators to our 30+ school sites. Expecting many problems, it was refreshing to know that the entire process had been handled as smoothly as I've ever seen. Despite the busyness of the season, Advanced Office really stepped up and delivered, literally. They are great to work with and go above-and-beyond the call for their end users." "Your professionalism and prompt reply made our selection for our new copy machines an easy process. 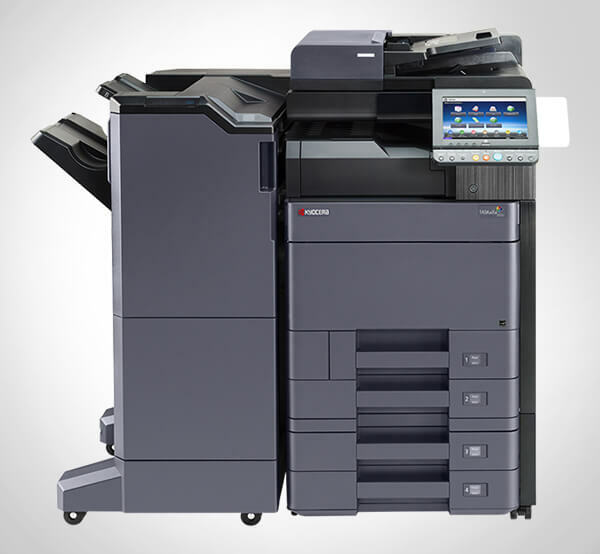 The staff has stated to me how much they have enjoyed the new Ricoh 4500 and the 5500 copy machines. Your attentiveness in training our staff has been exceptional and very much appreciated."